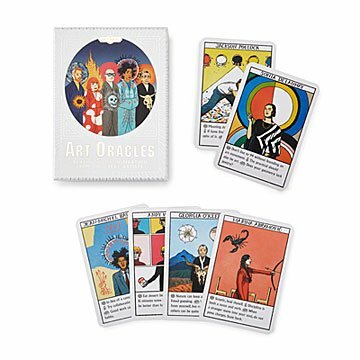 Get inspiring wisdom and advice from cards featuring artists whose thoughts are as original as their art. "Look directly at whatever you're avoiding," advises Diane Arbus. "If nothing else, be prolific," counsels Picasso. Great artists aren't known for conventional thinking, so whether you're suffering from creative block or struggling to make a difficult life decision, encounter a fresh take when you pluck one of these oracles from the deck. Each charmingly illustrated card contains three pieces of insight, wisdom, and advice inspired by the artist featured on it. With guidance for work, life, or inspiration, any obstacle becomes surmountable. As Frida Kahlo's card says, "Art is your most loyal companion." Deck comes with a booklet featuring fascinating artist biographies and details of how to use the cards. Made in China.